Most motorsport fans dream of going racing. But Paul Drayson, UK government minister, member of the House of Lords, father-of-five and pharmaceuticals multi-millionaire, has been working for the last six years to make that dream a reality, founding his own Aston Martin-backed team in the process. He passed a major milestone this summer with his first 24 Hours of Le Mans entry, after a campaign to persuade the FIA that being blind in one eye should not prevent him from holding an international racing licence. He spoke to Brits on Pole about what it meant to finally find himself standing on the tarmac at the Circuit de la Sarthe. “I can tell you, I was the happiest person on that track, back in June.” Paul Drayson is recalling the moment that he and co-driver Jonny Cocker walked out onto the Le Mans circuit prior to testing and realised – really, properly realised – that they were about to take part in one of the world’s great sporting events. 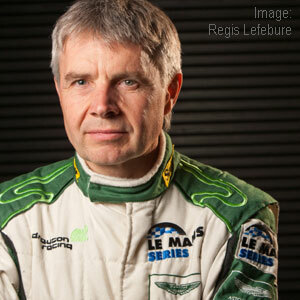 Lord Drayson took his Drayson Racing team to Le Mans for the first time this year. The journey to the Le Mans start line took the 49-year-old six years, dating back to a track day at Oulton Park when he realised that, having sold his world-leading vaccine business PowderJect to a pharmaceuticals multinational for £540 million, the time had come to try to realise his boyhood dream and see whether or not he could cut it on the track. He once jokingly referred to the process in an interview with The Independent as “a mid-life crisis.” But in fact he seems to have set about it with ferocious determination and focus: “When I sold my business, it seemed to me that it was something which I had always promised myself that I would try, so I had the opportunity to do it. “When I started I decided I was going to find out if I was any good at this by taking it really seriously, treating it almost like a job, I suppose. “I started with single-seaters doing historic Formula Ford. I was taught by Martin Stretton, the historic racer, and I think in my first year I did something like 30 races. I competed in various types of cars and classes, historic to start with, and then from historic Formula Ford I did a bit of historic sportscar racing, mostly with the Historic Sports Car Club. “The following year I started doing the Formula Palmer Audi feeder series and I did both the summer series and the winter series of that. And it was during that series that I heard that Aston Martin were planning to bring out a sports race car based on the DB9. This was a pivotal moment. Having got third of the way into the British GT season with them Drayson teamed up with Jonny Cocker, an accomplished GT driver and a BRDC Rising Star with the 2005 Porsche Carrera Cup championship under his belt as well as a strong record in endurance events. He had found his niche. “I absolutely loved that. It convinced me, the whole experience of racing a sportscar really felt to me perfect – a combination of being inside a car that had some relationship to a road car, and the nature of the racing which seems in many ways to be a lot more three-dimensional than single seaters, and much more interesting, particularly when getting into endurance racing. “And then Jonny and I teamed up for the first time the following year to do the championship together. And we had an absolutely fantastic year. We decided that we wanted to try and champion green technology so our car this year was run on a second-generation biofuel. And, much to everyone’s surprise, we were really competitive from the start. “Jonny took a pole first time out. And then we had a fantastic season, very narrowly missed winning the championship, and all through this time I knew that I had this limitation because of the international rules which prevent people who are blind in one eye from racing at international level. And it didn’t. His approach to persuading the FIA to change its corporate mind involved scientific research to show how the brain can adapt to the loss of sight in one eye, and also by demonstrating through his driving that he was safe, competent and competitive. “What I think gave me the big break was having come second with Jonny in the national championship, the British GT. We were able to race in the ALMS where I took the unusual step of taking a break from my day job to go and race in America, in the ALMS series. “And I think that it was there, really, that I was able to both convince the FIA and also to get my own experience to the point where everyone was really comfortable about me holding the international licence which I was able to get to be able to race at Le Mans this year. Drayson Racing entered the GT2 class where Drayson, Cocker and Marino Franchitti, younger brother of IndyCar champion Dario, managed a satisfyingly long period of trouble-free running time – until an electrical malfunction caused the car to shut down at the end of the Mulsanne Straight with only two hours and five minutes remaining. Drayson continues: “The alternator failed in the 22nd hour. These things happen. I think we are very determined to go back, having done the 22hrs of Le Mans… I think we all felt that the team did a really superb job. All three drivers, we didn’t put a foot wrong, we were very competitive, there wasn’t a scratch on the car and that’s no mean feat. “And it kind of really summed up for me what is unique about Le Mans. I actually took my family around the circuit on the Monday morning afterwards, before we were driving back to Paris, and, you know, driving down the Mulsanne Straight in a bus after having raced it is a brilliant experience. The team had plenty of positives to take away from Le Mans, not least the competitiveness of their biofuel-powered vehicle. But does using biofuel in the car make any difference to the experience of driving? People trying out performance electric vehicles have reported that some changes in technique are required to deal with the instantly-available torque, the lack of opportunities to induce oversteer when cornering and the unsettling absence of engine roar. And pushing forward with the bioethanol-powered car wasn’t the only investigation the team was involved in. The FIA’s medical staff were carrying out a research project during this year’s race to map the levels of carbon monoxide in drivers’ blood throughout the 24 hours of the event and to see if there is any long-term build-up of the potentially dangerous substance. These are just some of the ways that Drayson’s racing project sits easily with his career as a scientist and with his ‘day job’ as the UK’s Minister for Science and Innovation. But doesn’t he also race in the great British tradition of the gentleman amateur? “I do. I’ve been really fortunate, in teaming up with Jonny, he’s someone that I’ve been able to learn from. I take my racing very seriously. As an amateur, I try to be as professional as I can in my approach to – my fitness and preparation. “I think it is important that there is still the opportunity. If you go back, in Le Mans racing in particular there has been that theme of amateur, or gentleman, or privateer, or whatever word you want to use. And I think that it really adds to the feel and the character of the series, in having that. In November 2007 he took a leave of absence from government to cross the Atlantic and take part in the American Le Mans series, a vital part of his preparation for the 24 Hours of Le Mans. And, like plenty of British racers before him, he is full of praise for the American racing culture. “Yeah, it’s great. When we went to America we were really impressed by how friendly and positive the atmosphere was in the drivers’ meetings, in the paddock and that continues through the series. I think it is one of the friendliest series to drive in. “You have got all the professionalism, F1 drivers, very experienced sportscar drivers, but the actual experience of driving in this championship is of total professionalism but positivity too. People are happy doing it and they are friendly with each other, although they are very competitive out on track. “I think it’s very important, you know, because we are so lucky to be doing this. A lot of people follow their racing and love it but we have to just, I think, pinch ourselves every now and then, remind ourselves how lucky we are to be a part of this, and doing it. But it’s not just racing abroad that occupies him. Like every other race fan in this country he is exercised by the idea that the F1 British Grand Prix might be under threat, and keen that it is preserved, a process that he describes as “absolutely vital”. He added: “The motorsport industry in the UK is a huge success story, just the sort of high-value-added industry that we need in the UK and we need to make sure that we prosper and grow in it. You really felt that, I think, when you were at the British Grand Prix this year. “There was a real sense of that. A fantastic weekend, I think Silverstone did a really great job that weekend, and I am sure that everybody is going to be doing everything they can to ensure that the British Grand Prix stays in the UK. So, what does the future hold for Drayson Racing? It’s here that one of the moments of greatest insight occurs. It’s fair to say that many people in Drayson’s position might have been satisfied with a pay drive at an existing team, similar to Chanoch Nissany’s ill-fated adventure with Minardi, or felt his ambition was satisfied by at least making it onto the grid. But not Paul Drayson. He has a palpable, entrepreneurial desire to see a return on investment along with measurable results. He is not there to make up the numbers. “We want to win some races. Basically that is what we’re about now. I mean, we’ve had a really fantastic journey to actually get to compete in this, to qualify, to get my licence sorted out, to get ourselves to Le Mans and we came sixth at Spa. We want to get on the podium. “The future for us is to…. we’ve put a huge amount of effort into building a team in a very short time, Jonny and I have worked very hard together. What we want to do is to build on all of this and start getting some results. 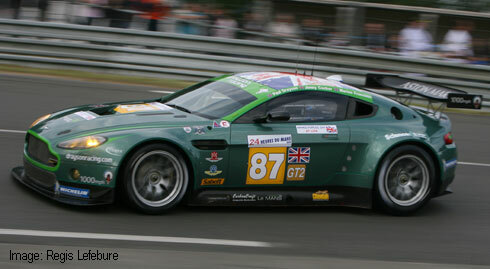 Categorised under Events, tagged under 24hrs of Le Mans, ALMS, Aston Martin, Aston Martin marques, biofuels, Drayson Racing, Jonny Cocker, Lord Drayson.